We are continuously gathering all of the Twitter traffic around IoT. It’s a dataset that goes back years! When you have ALL of the data, the ability to ask questions like “Which IoT Use Case is getting the most attention?” becomes a fascinatingly simple exercise. Answering this question is the beginning of understand what Use Cases are top of mind for the market, what language is being used to describe early IoT deployments, and whether YOUR particular Use Case is a blue ocean of possibilities or blood red ocean of ferocious competition… As you can see from the Mindshare chart below, Industrial IoT is the blood red ocean right now, but for good reason. The promise of cost savings, shifting from CapEx to OpEx, increased productivity and more mean that many of the early adopters of the potentially ill-named Internet of Things market are from big industry and manufacturing sectors. 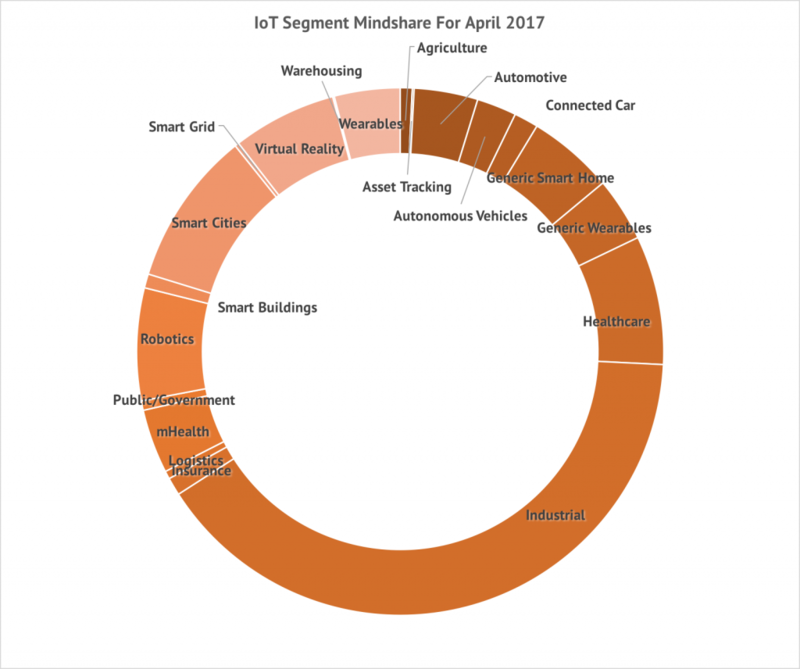 Share of Voice Chart for Internet of Things Use Cases for April 2017 showing continued dominance of Industrial IoT based on an analysis of over 1 million IoT tweets in April 2017. Other markets also get attention. Smart Home continues to be the main consumer entry point for the Internet of Things, and while most consumers do not show up at Best Buy asking for IoT products, much of the market conversation, especially from Europe equates Consumer IoT with Smart Home. Same is true with the stagnating market of Wearables, still occupying a significant part of the IoT Mindshare compared to government or Smart Buildings. Virtual Reality and Automotive are an interesting mix of consumer and enterprise, both getting significant share of voice within the conversation. More public works segments like Smart Cities and Healthcare broadly get more attention than generic mentions government applications of IoT. Early home runs in IoT of Logistics and Asset Tracking seem not to grab as much attention, largely because these are being lumped into Industrial applications of IoT and do not drive as much eyeballs as their significant impact on operations would suggest. Now imagine if you had the ability to dig deeper into each of these markets. Understand what topics and channels are driving the conversations around Smart Agriculture or mHealth, to see where you brand impacts the narrative or is ignored by others because your competition’s siren song of adoption is drowning out your message. Well, you can. Argus Insights makes all of the data and the tools to discover the evidence you need to move markets to your ways of thinking available through our Argus Analyzer tools. If you’d like to get access to the same tools we use to fuel our analysis of the IoT market narrative, you can find out more here. With over a million IoT tweets a month, the only way to stay on top of it all is using our platform to ensure your team is moving the market narrative in the direction of growth and influence.